This is a day we’ve been looking forward to all summer. L somehow became a huge fan of The Wiggles and has enjoyed WIggly Dance Parties in our living since she’s learned how to walk. Last Spring, The Wiggles announced a North American Tour with a stop in Detroit. Of course, we snatched up tickets as soon as they went on sale. We made it to Detroit about an hour before the show started at the Fox Theatre. It was easiest to just park in the Fox Theatre ramp because there was also a Tigers game going on at the same time. Once parked, we walked around front to Woodward and decided we should probably eat before the show. Out of convenience, we chose Hockeytown Cafe right on the corner of Woodward and Montcalm Street. The building is connected to the parking ramp and right across Montcalm Street from the Fox Theatre. It’s actually owned by Olympia Entertainment which also owns the theater. As you would assume from the name, Hockeytown is a large sports bar. It’s location right near both Comerica Park and Ford Field draws big crowds before and after games. The Tigers game was already in progress when we got there, so we didn’t run in to much of a sports crowd. Nope. We ran in to a children’s band crowd. The three level sports bar is covered with LCD TV’s and hockey memorabilia. There’s a lot of red and white in the decor but they do have hockey items from other teams in the form of autographed jersey’s and the like. We were shown to a table on the second level dining room. We didn’t specifically ask for a high chair but it wouldn’t have mattered. All of the high chairs and boosters were being used. There were a lot of families eating lunch…I bet they’re not used to that. The table we were shown to has a both along two sides and chairs on the other two. We put L in between us in the booth. That worked out great for her because two of the three booths around us had little ones as well and they all stood on the seats and talked to each other while the adults ate. As much as I wanted a drink, I went thought it better not to and ordered a Pepsi while J got an Iced Tea. We got a little cup of water for L with her own straw which is how she prefers to drink at restaurants now. We only had an hour before the show, so I was hoping the waitress would keep things moving and she really did. When our drinks were brought, she asked if we were ready to order. I looked at J and she said she was…and of course, so was I.
I ordered the BBQ Smokehouse Burger. The burgers are fresh ground round and this one comes topped with apple-smoked bacon, caramelized onions, BBQ sauce, and smoked cheddar cheese. The sandwich is served on a sesame seed bun and comes with seasoned steak fries. 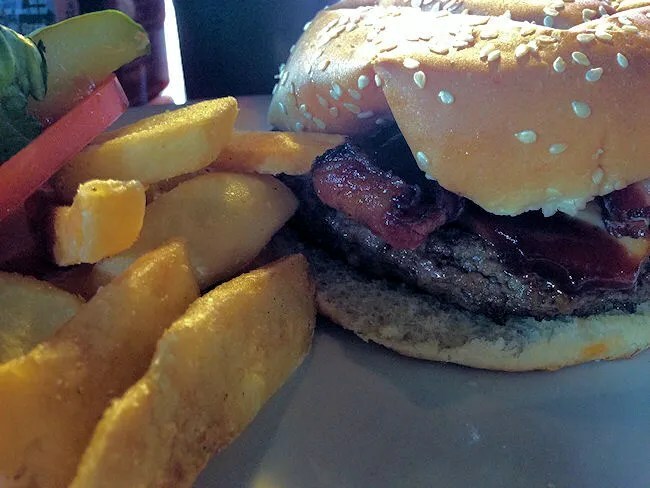 The burger was pretty tasty, but it was a pretty standard sports bar burger. It didn’t have any stand out characteristics, but it was enjoyable. J’s selection was the Michigan Salad. 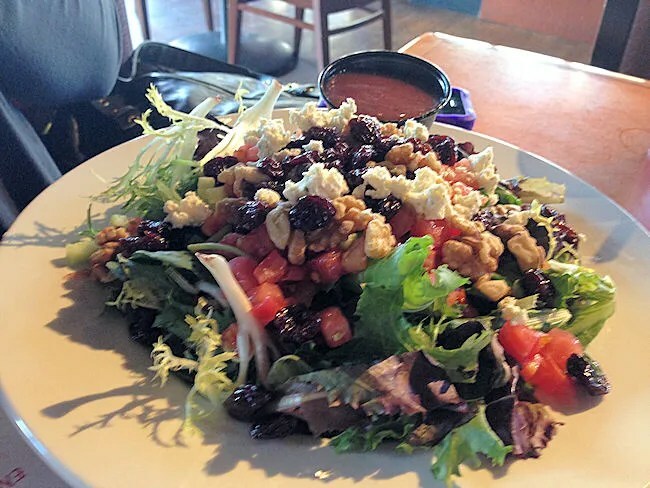 The large plate of mixed greens comes topped with Boursin cheese, Traverse City dried cherries, diced cucumbers, tomatoes, red onions, and chopped walnuts with a raspberry vinaigrette. She ordered the salad with the onions and should have ordered it without the tomatoes as well. She said the salad had a lot of toppings and not a lot of greens. What greens they did have were a lot of frisée which she’s also not a fan of. In the end, she only ate about half of the salad. She enjoyed what she had, but I think she wishes it was put together just a little differently. For L, we ordered the Kid’s Grilled Cheese. 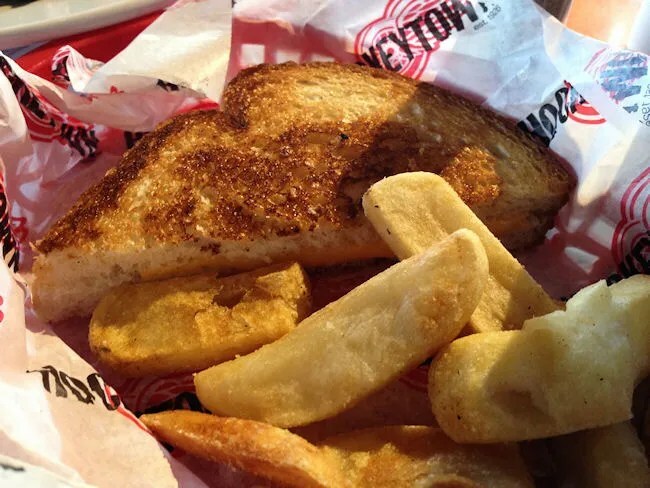 The standard grilled cheese is made on Texas Toast and served with steak fries. L ate quite a bit of the sandwich, but J and I had some too. For a kid that normally loves french fries, L was only lukewarm on the steak fries. She liked the taste, but couldn’t get past the larger cut fry. We tried to rip them in half for her so they looked familiar to her. Our bill was just under $30 and we got over to the theater in plenty of time for our show. 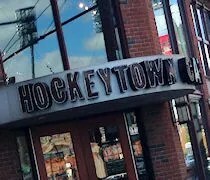 Hockeytown Cafe’s biggest draw is it’s location. As a sports bar, the place is pretty fantastic. It’s a nice big, loud place to watch a game and have a few beers. Food wise, it was pretty good. I was happy that it wasn’t really overpriced due to it’s location. I also was really happy with the service as everything was kept moving. We never had to ask for anything as our waitress was on top of the meal. 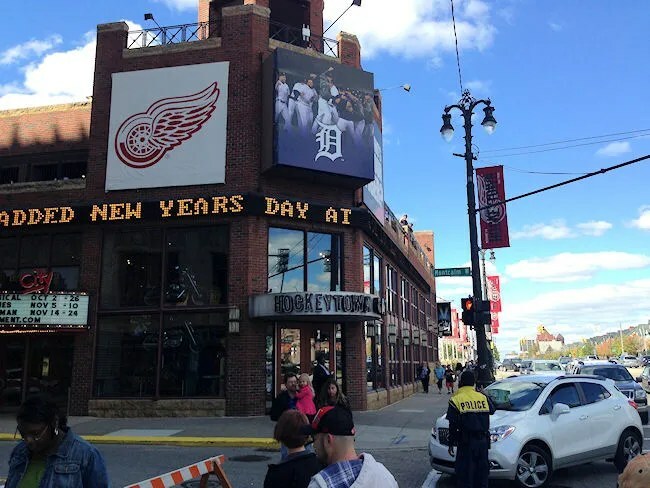 Hockeytown’s a good choice if you’re in the downtown area for something. Not sure it’s a destination place for dinner…but it definitely is to catch a game. I know you’re not always into the deep dish pizza, but their version of the Detroit square pie was pretty good for not being a pizza place. Very similar to Jet’s. Detroit Deep Dish is one of the few deep dish pizzas I like……Malnati’s in Chicago being the other. Good to know for next time….thanks!